What is the Reggie’s Evil Eye Effect? Where can I download the Reggie’s Evil Eye Effect? How do I use the Evil Eye Effect? How do you do the Evil Eye Effect? 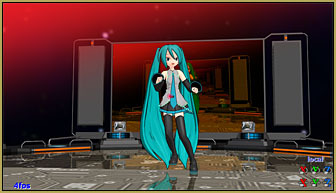 That little video was made within MikuMikuDance, MMD 9.26, without any outside editing… that 35-seconds uses four stages and plenty of scene transitions; all within the single saved .PMM file. The “black-out” moments are created by using the Reggie’s Evil Eye mask at a large Si size to mask the scene while you change stages. Reggie’s Evil Eye effect uses a series of masks coupled with Beamman’s Nameplate Effect to let you generate that Japanese Anime shadow effect in which the camera zeros-in on the character’s face to show the shock on her face in reaction to an embarrassing situation. You will not need to download anything else… the Reggie’s Evil Eye effect includes Nameplate, so Evil Eye will work as a simple MME effect. … SEE how to adjust the Nameplate Effect. … but you can do more! As powerful as that simple action is, you can also do scene-transitions… using a large Si setting, you can do a fade-to-black while you change the set behind the black moment… and when you lift the effect, a whole new stage can be there. In this moment, I used the Red CC mask at a large size… like a Si of 80… large enough to allow the whole scene to be seen, and then positioned the mask so as to let the soft edge of it cover the upper-left of the camera’s view… a simple, wonderful effect! … Note, in the video, that the colored shadow stays in place as the scene revolves (the camera moves) underneath it! See the original Reggie’s Evil Eye write-up… and download it for yourself from the LearnMMD.com Downloads page. Have fun with Reggie’s Evil Eye!